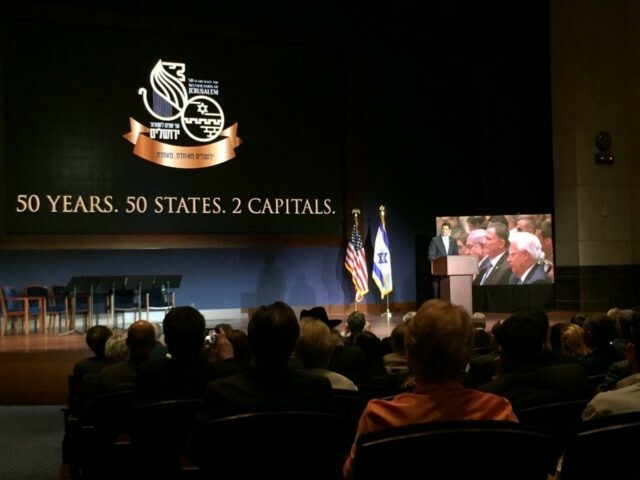 The United States Congress held a special commemoration of the 50th anniversary of the liberation and reunification of Jerusalem in the U.S. Capitol on Wednesday, with a live television link to a similar ceremony at the Israeli Knesset. Speaker of the House Paul Ryan and Israeli Ambassador Ron Dermer were the featured guests in Washington, DC, while Prime Minister Benjamin Netanyahu, Speaker of the Knesset Yuli Edelstein, and U.S. Ambassador David Friedman attended the Knesset ceremony. There were also live video links with audiences in all 50 U.S. states, where supporters of Israel had gathered to watch, and to participate in, the commemoration. Various state capitols also participated in the event. “Americans have come together to celebrate Jerusalem, the eternal shining city on a hill,” Dermer said in his opening remarks. Jerusalem had been divided after Jordanian forces occupied the eastern part of the city, including the Old City, during Israel’s War of Independence in 1948. The Jordanians expelled Jews from the Jewish Quarter of the Old City, and destroyed it. In the Six-Day War in 1967, Jordan joined Egypt and Syria against Israel. Israel responded to Jordanian shelling by opening an offensive in the West Bank (Judea and Samaria), and attacking Jordanian forces in Jerusalem. On June 7, 1967 (28 Iyar on the Hebrew calendar), Israeli forces conquered the city and liberated it, reunifying the city under Jewish sovereignty for the first time in nearly two millennia. In his own speech, Speaker Edelstein noted that the Western Wall whose stones President Donald Trump had touched on his recent visit were freed from occupation fifty years ago by Israeli paratroopers. Speaker Ryan recalled the story of the fight for Jerusalem, and the sacrifices of the Israeli soldiers to liberate the city. He stressed that Israel had ensured Jerusalem was “a free city for all” religions. The U.S. Army brass quintet performed “Jerusalem of Gold,” a song written by Naomi Shemer before the 1967 war (performed here by Ofra Haza), whose last two verses were added after Jerusalem’s liberation to celebrate the return to the Old City.